Architect Thomas Simpson is to be honoured for the schools he designed in Brighton and Hove with a blue plaque at West Hove Infant School. The building in Connaught Road is one of several school buildings in the city he designed while architect and surveyor to the Brighton School Board. 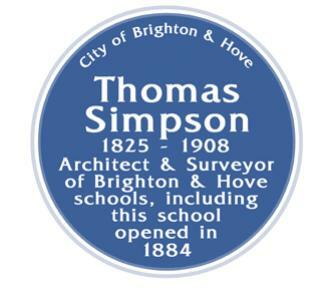 And when he first started to practise, in 1856, his early work involved chapels and churches like the Belgrave Street chapel and school in Brighton, now converted into flats. West Hove Infant School was originally part of the Connaught Centre for adult education, which the Brighton Society campaigned to be listed to avoid possible demolition. The Society has now raised funds to pay for the blue plaque which is to be displayed on the building. designed Roedean as well as schools and other significant public buildings elsewhere. The plaque will be unveiled by the Mayor at 3:45pm next Thursday.